Death Valley is the largest national park in the contiguous United States: 3.4 million acres of desert vastness. At first glance it appears to be a barren wasteland, to be hurried through as quickly as possible. The alert visitor soon recognizes that there are a lot of things to do in Death Valley. You need a four-wheel-drive vehicle to see some of Death Valley's curiosities and historical sites, but these top sights are accessible by any passenger car and involve only short walks. If you start early, you can cover them all in a day if you get an early start and don't spend too much time in any one spot. The valley is hospitable only during the cooler months and days will be short. Take a picnic lunch to make the most of the daylight. Death Valley can be baffling to the first-time visitor, with its unusual geology, plants, and animals. Don't go around feeling confused when you don't have to be. Instead, go to the Visitor Center near the Ranch at Death Valley before you do anything else. Browse through the exhibits and talk to the rangers, and you'll get a lot more out of your trip. This Death Valley day tour itinerary assumes you start in the Ranch at Death Valley area. To get a quick overview and see some of the most spectacular sights in Death Valley, take the 18-mile drive south from Furnace Creek to Badwater on CA Hwy 178. If you are staying at Stovepipe Wells, you can drive directly to Furnace Creek to begin. The Salt Flat: A few miles south of the Furnace Creek junction, take a short side trip on West Side Road toward Dry Lake into the otherworldly landscape of the valley floor. Depending on recent rain patterns, you may find those beautiful web-like patterns you've seen in photos. The Devil's Golf Course is nearby. It's called that because it's so rough that only Lucifer himself could try for par. To avoid destroying the delicate salt structures, tread lightly. Badwater is the lowest place in the western hemisphere. The precise location of the lowest point (292 feet below sea level) isn't marked, but a walk from the parking area leads past the salt-laden, bad-tasting watering holes that inspired its dire-sounding name. Across the valley, Telescope Peak towers 11,039 feet above, twice as tall as the Grand Canyon is deep. To get an idea of just how low this spot is, look for the sea level marker on the cliff above the parking area. Artist's Palette is a colorful rock formation, a landscape smudged with pastel colors. It's especially striking in the early morning or late afternoon. See it on the way back to the Oasis at Death Valley by turning onto Artist's Drive. To its side is a dry wash that's sometimes called R2's Canyon, named for a scene from the original Star Wars film where the plucky little droid moves through it while sounding like a scared little kid. Back at the highway junction near Furnace Creek, go south to get a bird's eye view of the valley and its surroundings. If you've only got a day in Death Valley, stop at Zabriskie Point for a look across Golden Canyon, then turn back north toward Furnace Creek. If you've got more time, take the approximately 50-mile round trip to Dante's View. More than a mile above Badwater, it offers more expansive vistas, and the temperature is usually 15°F to 25°F lower than on the valley floor. While you're there, stop and be quiet for a moment. You'll most likely hear... absolutely nothing. This is one of the most silent places in the state. The rest of these top sights are in the northern part of Death Valley, reached by driving on CA Hwy 190 north from Furnace Creek. Salt Creek is one of the wettest places in the arid Death Valley landscape. It's an easy walk from the parking area on a 1/2-mile-long boardwalk to see it. The seasonal stream of salty water is the only home of the rare Salt Creek Pupfish, but even if you don't spot the little critters, it's a fascinating place. The most accessible sand dunes, Mesquite Dunes are just east of Stovepipe Wells. On a short hike into them from the roadside, look for tracks of the kangaroo rat (a meandering line with small tracks on either side) and other desert creatures. Scramble to the top of a dune and enjoy the view. Scotty's Castle: A flash flood in 2015 washed out the road to Scotty's Castle. It is closed until 2019, according to the National Park Service. If you have time after it reopens, take Scotty's Castle Road to visit and find out why it's called Scotty's Castle if Albert Johnson owned it and Scotty lived elsewhere. Are the tales of hidden gold mines, shady deals, and general trickery real? A living history tour of the Spanish-style home in the desert examines the unusual relationship between a desert rat named Scotty and a Chicago business person that resulted in this improbable structure. You can also take tours that go into the basement or out to Death Valley Scotty's cabin. Ubehebe Crater may make you think you've landed on the planet Mars. It's not a volcano, but the result of a violent explosion of superheated groundwater, a 2000-foot deep crater that offers photo opportunities and hiking. Its name means "windy place" and with good reason. A warmer jacket or shirt (zipped or buttoned to keep it from turning into an impromptu sail) will make you more comfortable here. 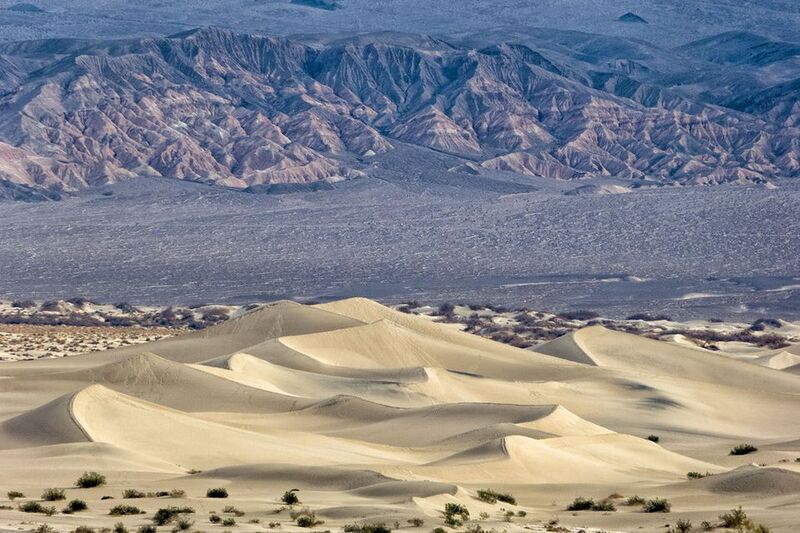 These sights will give a brief overview of Death Valley, but there are many more things to see if you have time. If you have a four-wheel-drive vehicle or rent one from Farrabee's Jeep Rental near The Oasis at Death Valley Resort, you can access some of the park's more remote and unusual features such as The Racetrack with its mysteriously moving stones, along with ghost towns, charcoal kilns, and slot canyons.